The Eugene, Cascades & Coast region is easily accessible by interstate, highways and scenic byways for efficient travel from one adventure to the next or backcountry roads that make the journey more than half the fun. 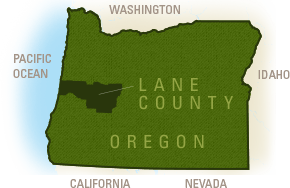 Interstate 5 (I-5) and Highway 99 travel north south through the rich farmlands of the Willamette Valley. Highway 101, the Pacific Coast Scenic Byway, stretches the entire length of the Oregon Coast making it easy to explore the rocky headlands and Heceta Head north of Florence and the Oregon Dunes National Recreation Area to the south. Highway 126 starts from Florence on the Oregon Coast passing through Eugene and continues along the McKenzie River to the Cascade Mountains. Highway 58 runs southeast from I-5 just south of Eugene through Oakridge over Willamette Pass and connects to Highway 97 making it a popular route to Crater Lake National Park. For current road and weather conditions visit www.tripcheck.com or call 511. Use I-5 or Highway 99. If travelling to Eugene from southern Oregon east of the Cascades Mountains, use Highway 97 to connect to Highway 58. At Florence travel east on Highway 126. Travel west on Highway 126 from Bend and Central Oregon over the McKenzie Pass. During the summer if you enjoy an extra scenic route, at Sisters take the Highway 242 - The Old McKenzie Highway Scenic Byway. This road is closed in winter. This route is very windy, closed to vehicles longer than 35 feet (10.7 m) in length, and trailers are not allowed. From southeastern Oregon and Highway 97 take Highway 58 over Willamette Pass through Oakridge - Westfir. Take I-5 north.